Now the dust has settled, what did Lima bring? For many of us, after each climate COP it’s the time to ask not so much “what did we lose and who do we blame,” but rather “what did we get, what can we work with?” My last update was on the Saturday afternoon, and the talks were to go on late into the night. I always laugh when looking at updates the next day announcing a final press conference at 2.30 am. Who books a press conference at that time of day, except at the outcome of a climate talks? Yes, it was disappointing. The very bare bones of what we need going into Paris next year. There have been so many think pieces, so much analysis that everyone will have read by now, that it’s probably better to point to them rather than do my own. Carbon Brief did a great overview, the BBC a reasonable piece, and the Union of Concern Scientists’ Alden Meyer a detailed look. Author cindyPosted on December 22, 2014 Categories Climate business, Climate politics, environment and ecologyTags COP20, emissions, Lima, MFAT, Tim Groser12 Comments on Now the dust has settled, what did Lima bring? Today’s news that the US and China have agreed a long term policy to reduce carbon emissions is being hailed as a “game-changer” in international climate negotiations. China has agreed to cap its emissions in 2030 — the first time it has committed to anything more than a reduction in the carbon intensity of its emissions, while the US will aim to cut emissions by 26-28% on 2005 levels by 2025, up from its current target of 17% by 2020. [BBC, Guardian, Climate Progress.] 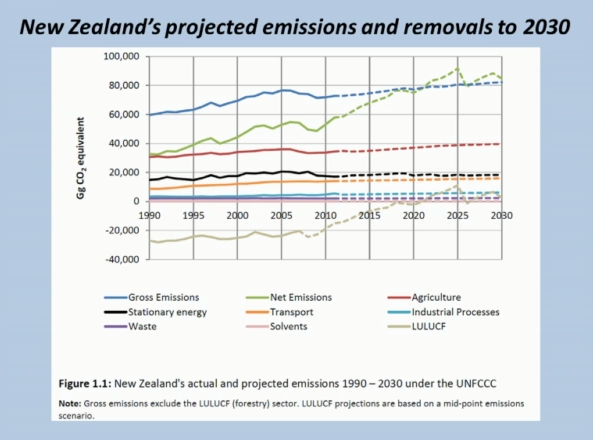 Meanwhile, NZ’s third term National government is being warned by its own civil servants that its current emissions policy settings commit the country to substantial emissions increases over the same time frame. These commitments will frame the levels of ambition required of other states at Paris next year. Climate modellers will no doubt now be rushing to determine what these new commitments, if delivered successfully, will mean for combating global warming. The US and Chinese cuts, significant though they are, will not be enough to limit the total increase in the atmospheric carbon dioxide unless other states engage in truly radical reductions. In other words, global emissions are likely to continue to grow, probably until 2030, which will make it impossible to hold global warming below the world’s agreed limit of 2ºC above pre-industrial levels.